Whenever I add a new piece to my wardrobe, it's as if a new little object has been added to a 'fashion kaleidoscope'... resulting in new combinations, images and looks. The playtime at home is the part I most look forward to when making a new purchase. It is all about finding out which of the existing items will work with the new addition, and seeing new outfits and combinations evolve. Some of the combinations I might have anticipated while contemplating the purchase, but also when you get home, you might discover nice surprises along the way. It is a joy to see how a new piece can cast a completely different light on a cherished staple, or bring pieces together which previously had nothing in common. The tri-colored shoes are wonderful to play with, and since many of you are familiar with my accessories and capsule wardrobe pieces, I thought it would be fun to invite you into my closet, to discover the resulting looks and combinations together. This week is therefor called 'closet playtime', with frequent updates and pics to come. Very interesting, I am waiting with curiosity! (Hope Monsieur et Madame, which I like so much, will find its place in the series). You really selected the best topic, the question each woman has in her head when heading towards the fitting room - will it work with rest of my wardrobe? 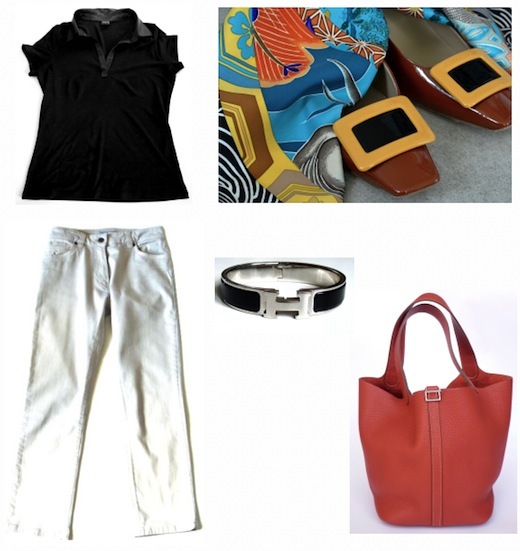 I must confess that I more and more select the clothing in line with my accessories (e.g. scarves), not vice a versa. I am sure you will make wonders out of this topic. Thank you, dear Jane. Hope you'll enjoy the follow ups too! Love your Carré en Carré <3! 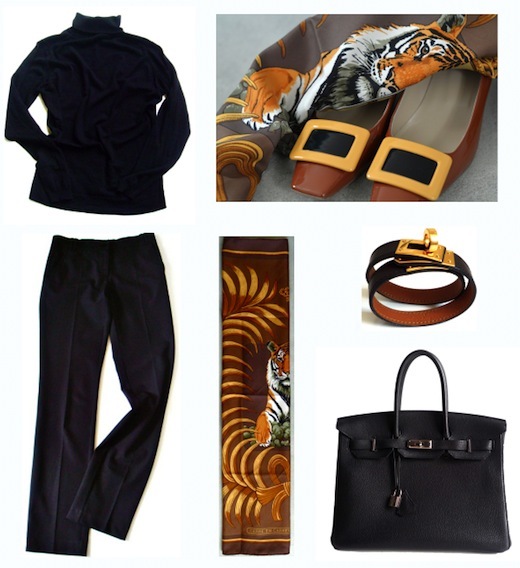 It 's such a versatile scarf being Le Tigre Royal a perfect match to your beautiful Belle Viviers! Look very much forward to more posts and can assure you that I'm really having fun. Looking forward to this weeks play time! Hope you'll enjoy the posts! Love it! Looks ah-mazing, dah-ling! Can't wait to see what other combos you come up with. Thought of you, my dear friend! Must take a group shot! Hooray!! Lovely to get the chance for a peek inside your wardrobe playtime. So many of your pieces work together. You have such classic style Maitai. Thank you Monica. And a very warm welcome to you! Are you leaving in Paris ? Oh I have just caught up with all of your looks - all in my favourite colours, what a fun week of posting!